A merrymaker, professional jester, whose business it is to entertain the guests at a marriage-feast with drollery, riddles, and anecdotes. Whether they existed in Talmudic times is not certain. Two men are reported to have represented themselves as such: "We are merrymakers ("badduḥi") and cheer up the sad. Wheresoever we see two men at enmity, we try to make peace between them" (B. Ta'an. 22a). See Marriage, Wedding Festivities. In the Middle Ages we find among the Jews traveling merrymakers, who probably patterned themselves after the troubadours, and took the place of former voluntary entertainers at weddings. Their task was by jest, music, and humorous song to provoke joviality. The name given them originally in Jewish writings is "leẓin," a term which occurs in "Asufot," by R. Elijah b. Isaac of Carcassonne, who lived in the early part of the thirteenth century. The jesters were obliged to possess not only comic ability, but also a certain deal of learning, since those jokes were appreciated most which were connected with Scriptural verses or Talmudic passages. Such scholarly comedians were in vogue largely in the Middle Ages. As the clouds of persecution, however, continued to gather round the Jews, merriment was discouraged. R. David Levy in his "Ṭure Zahab" (Golden Rows), which appeared about the year 1680, inveighs against wedding festivities, and against the fashion of engaging leẓin in particular. "At some marriage banquets," he complains, "there is a custom of intoning the 'Ḳaddish,' which is a sin, for naught is permissible on such occasions save the recital of the grace of God. A sin more grievous, however, is to engage leẓin who try to amuse the guests with jests on Scriptural verses and holy words. Happy the man who abstains from such!" (Oraḥ Ḥayyim, § 560.) Similar advocates of soberness at wedding-feasts based their opposition to merriment at such gatherings on the Mishnaic report that with the siege of Jerusalem bridal processions were shorn of their festive nature, and that with the fall of the Holy City they assumed even the hue of mourning (Soṭah ix. 13). Meantime, the wedding-jester was styled "marshallik," a word which is not a corruption of "mashallik," derived from the Hebrew "mashal" (= proverb, anecdote), but represents, no doubt, the old German "Marschalk," or "Marshall" (compare Grimm, "Wörterbuch," p. 1674, also s.vv. "Schalk, Schalknarr"). In the seventeenth century, marshalliks prevailed in Poland and were not held in high esteem, as is clear from a query addressed to R. Jair Ḥayyim Bacharach, as to whether it befitted a scholar who was musical to forego his dignity and play at a wedding. Bacharach stigmatized the professional jester as "a man playing the fool in order to provoke laughter; such a wedding is called a seat of scoffers, for it is not real rejoicing, but hilarity and folly" (Responsa, § 205). In the early days the services of the Badḥan were mainly called in at weddings, where the Badḥan amused the guests by jests of a somewhat broad character, while the more serious discourse was given by the rabbi. In Russia he tended to combine both functions, delivering the address to the bridegroom and bride as well as amusing the whole company at table. 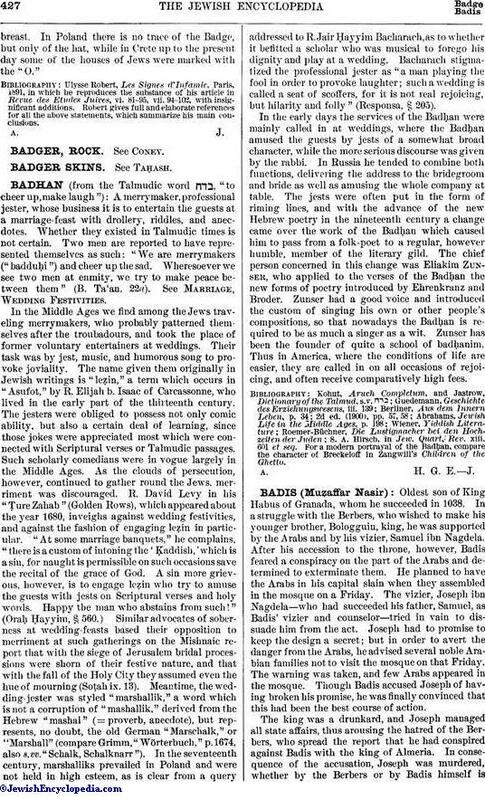 The jests were often put in the form of riming lines, and with the advance of the new Hebrew poetry in the nineteenth century a change came over the work of the Badḥan which caused him to pass from a folk-poet to a regular, however humble, member of the literary gild. The chief person concerned in this change was Eliakim Zunser, who applied to the verses of the Badḥan the new forms of poetry introduced by Ehrenkranz and Broder. Zunser had a good voice and introduced the custom of singing his own or other people's compositions, so that nowadays the Badḥan is required to be as much a singer as a wit. Zunser has been the founder of quite a school of badḥanim. Thus in America, where the conditions of life are easier, they are called in on all occasions of rejoicing, and often receive comparatively high fees. S. A. Hirsch, in Jew. Quart, Rev. xiii. 601 et seq. For a modern portrayal of the Badḥan, compare the character of Breckeloff in Zangwill's Children of the Ghetto. A. H. G. E. J.